I heard a praise chorus as I drove home last night from work that repeated this verse over and over. While that kind of music does not rate in my top five of preferred styles, a thought crossed my mind. It disturbed me, caused pain, and yet also provided some personal affirmation. The pain comes from what I see religion doing to children of God. People are condemned for the form of baptism they used, the kind of clothes they wear, the enthusiasm they have in worship (or apparent lack), because they don’t (or do!) speak in tongues, because they follow the Bible instead of pledging submission to human authority, etc. 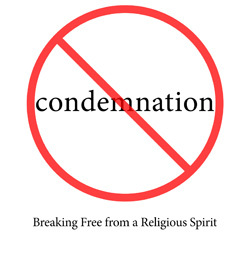 On a personal level, I have been condemned by religion. Each time the actual accusation was unprovable, played on only by religion’s worst fears. So while a power-hungry official or leader manipulated weak people and condemned me in human terms, before God I “can no longer be condemned”. While I am at peace with my Saviour, Creator assures the innocent believer that despite religion’s sin of power no wrongful accusation stands before the True Judge of the world. While I recognize the opinion of others has no eternal bearing if it differs from the view of Creator, destroyed careers and betrayals and the temporary victories of the devil hurt. Yet I treasure this assurance: the hate and death perpetrated by evil was inflicted on the prophets (Matthew 5:12), and whatever evil thinks it gets away with, nothing can separate the innocent blood from the love of Christ Jesus (Romans 8:38). Eternity lasts longer than any religion’s false condemnation. I will outlive and outlast any kangaroo court set up by religion, devil or Judas. “Therefore, we, who do not live by our corrupt nature but by our spiritual nature, are able to meet God’s standards” (Romans 8:4 God’s Word). See also verse 34. “God loved the world this way: He gave his only Son so that everyone who believes in him will not die but will have eternal life. God sent his Son into the world, not to condemn the world, but to save the world. Those who believe in him won’t be condemned” (John 3:16-18a God’s Word). It sounds heavenly! I get anxiety just thinking about ‘programs’. Isn’t Jesus technically at every service? I often wonder what Jesus would toss out and turn over if He showed up at the average church service today?